Preheat oven to 375 degrees. Spray muffins tin . In a medium size mixing bowl beat butter and brown sugar, add eggs beat until fluffy. Add buttermilk, pumpkin and vanilla. . Gradually sift in the flour mixture mixing until well blended. Stir in the dried cranberries . Spoon batter into muffin tins about 3/4 full. Bake in preheated oven until a toothpick inserted comes out clean, 20 -25 minutes. Cool slightly before removing from pans. I have always preferred to make my own pie crust. 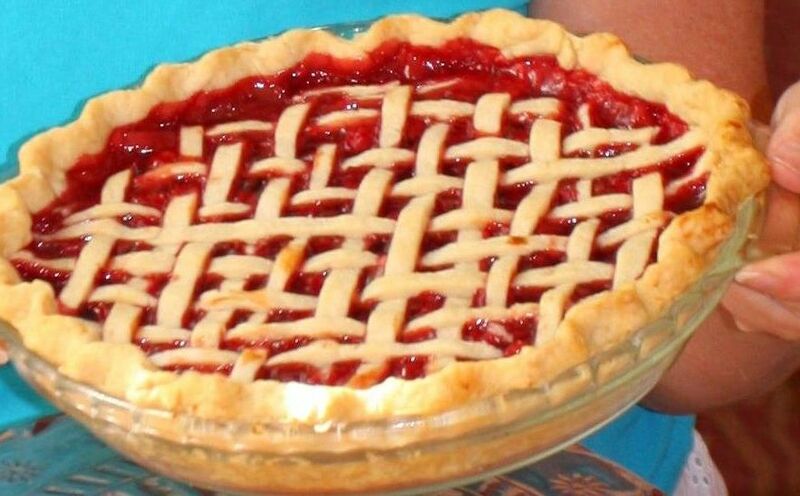 I have over the years used many recipes from the "never fail" pie crust recipe that contains vinegar and water to recipes with butter and shortening combinations. I find I like this simple recipe the best. I found this recipe from Randy's grandmothers old cookbook "Woman's Home Companion" published in 1942. Sift flour; measure; add salt and sift again. Using a pastry blender cut in shortening until particles of the fat are about the size of peas. Sprinkle ice water 1 tablespoon at a time over small portion of the flour mixture; with a fork press the flour particles together as they absorb the water; do not stir. Toss aside pieces of dough as formed and sprinkle remaining water over dry portion; use only enough water to hold the pastry together. It should not be slippery and wet. Press all together lightly with the fingers or wrap dough in wax paper and press together gently. Bear in mind the less the dough is handled the more tender and flaky the pastry will be. Chill dough. Makes two 9-inch pastry shells. Note: If a flakier pastry is preferred cut all the fat into the flour coarsely until the particles of fat ae about the size of small peas. Use of ice water and thorough chilling of the pastry before baking also help to give an extra flaky crust. If more tender mealy pastry is preferred cut all the shortening with the flour until the mixture resembles coarse corn meal. Use water at room temperature and do not chill the pastry. Nut Pastry: Add 2/3 c. ground pecans, walnuts or black walnuts. Good for butterscotch or chocolate cream pies and for custard pies. Cheese Pastry: Decrease shortening to 1/2 c. Add 1/2c. grated cheese. This recipe is like a Snickerdoodle but more butter and the warm flavor of brown sugar! Preheat oven to 300 degrees. Combine 3 T. sugar and 1 T. cinnamon in a small bowl and set aside. Blend dark brown sugar and white sugar in a large bowl with mixer on medium speed. Add butter and blend until grainy. Add eggs and banilla, mixing until light and fluffy. Sift flour, baking soda and salt into sugar mixture, mixing at low speed just long enough to combine . Overmixing with make a tough cookie. Chill dough 30 minutes. Roll dough into 1 inch balls, then roll each ball into cinnamon-sugar to coat. Place cookies on ungreased cookie sheet and bake at 300 for 18 - 20 minutes. Cool on rack. Makes 5 dozen. In a large bowl, sift together flour, baking powder, salt, and sugar. Make a well in the center and pour in milk, egg and melted cool butter; mix until smooth. Let rest 10 -15 minutes while the griddle or frying pan heats to medium -high. Pour batter onto hot griddle, using approximately 1/4 c. for each pancake. Brown on both sides. Serve hot . I love pancakes!!! Too much. I order them time and time again in restaurants only to be disappointed by box mixes, even at my age! Pancakes and waffles are the first things I actually started cooking as a young girl, on Saturday mornings, for our large family back in Michigan. To this day, as I read this recipe and the instructions state, make a well, it takes me back to my mothers kitchen, learning what a well is in the flour mixture. 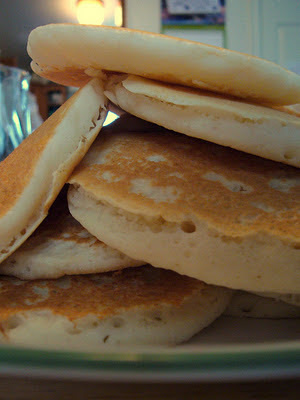 This is my favorite pancake recipe, rich and buttery. I do like a 50/50 whole wheat to white flour. I will add raisins,nuts and cinnamon. Mash bananas and blend them in. Stack them high with fresh sliced strawberries toppling over them. I will leave them plain and stuff them with scambled eggs and topp them with maple syrup with a side of bacon. I love pancakes!